A QR code containing a message for the coming generation is featured at the top, with the year 2016 on the left and the inscription LATVIJA at the bottom part of the obverse. The reverse features 25 raised facets that symbolise the years devoted to entrepreneurship. 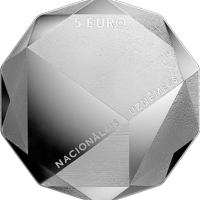 The inscription 5 EURO is placed at the top, with the words NACIONĀLAIS UZŅĒMĒJS running slantwise underneath. Marking the anniversary of Latvia's renewed independence or thinking about the future of our country, we have to remember that political independence cannot materialise without full economic self-sufficiency, to which the national entrepreneurs who create jobs and pay taxes are important contributors. The economic stability of the country is a guarantee of the prosperity of its inhabitants, and the foundation for this was the work of those entrepreneurial, courageous and responsible people who began to establish businesses right after Latvia regained independence, managed them through the twists and turns of economic development and now can proudly look back on what they have achieved. The 1990s in Latvia was a time when its economy was just beginning to operate according to free market principles and was in search of the best options for its development. It was also a serious test for human decency and honesty, for it was much easier to choose "fast money". At the same time, it was much harder to survive for those who attempted to be proactive in their behaviour and way of thinking, and were building a sustainable model of development aimed at creating added value. Progressive intellectual movements formed at different periods of time have inspired not only the creation of national treasures of art and culture; they also induced entrepreneurs to see the connection between their enterprise, development of the respective industry and viability of the entire economy. The 19th century Movement of New Latvians encouraged the businessmen who justified the name of national entrepreneur by boosting activity and achieving good results; at the end of the 20th century, a generation of entrepreneurs emerged in Latvia who managed to create a stable foundation for their young counterparts educated in various parts of the world to continue their activities in Latvia. The growth of the Latvian economy has also been the result of honest and tireless work by national entrepreneurs. From simple and small commercial structures, they have managed to create sustainable, socially responsible and competitive businesses, which while retaining the essential values are finding new solutions and using unique technologies. In a changing environment affected by internal and international factors, the ability of entrepreneurs to orient themselves in markets and economic developments, along with their readiness to react flexibly, allows them to retain and even increase market shares in Europe and also succeed in satisfying the growing domestic demand. It is the appropriate way to balanced economic development and growing prosperity of the population, with employment improving and wages going up. National entrepreneurs are the core of an enterprising country, and they raise the hopes of the Latvian people inside and outside the country. The reverse of the coin features 25 raised facets that symbolise the years devoted to entrepreneurship, and the obverse has a QR code with a message for the next generation of entrepreneurs: "WORK WITH COURAGE, DETERMINATION AND RESPONSIBILITY!" The obverse of the coin is smooth, symbolising the extensive area of work that the future generations have to populate with their values. 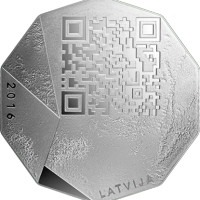 The coin features an encoded message: the development of Latvia depends on honest, untiring work. It shines like a jewel, indicating how important the national entrepreneur is to Latvia. * Latvijas Banka expresses gratitude to the Latvian Chamber of Commerce and Industry and the construction enterprise Arčers Ltd. for their cooperation in implementing the concept of the coin.